In the ever-increasing world of blogging, there are new personalities emerging daily. Whether writing about style, food, movie critiques, fresh-faced writers and photographers are finding ways to share their thoughts in the blogosphere. To welcome these emerging bloggers, senior writers have created the Liebster Award. This honor recognizes new blogs for their great content. I am thrilled to announce my recent Liebster Award nomination! I have been nominated by Style Nacho, a fellow new blogger who writes effortlessly about fashion, beauty, and personal style. The fashion-finder introduces a new perspective on upcoming trends such as winter-to-spring wardrobe transitions, three ways to chambray, and (wait for it!) how to rock a denim pencil skirt. 2. Answer the 11 questions given to you by the nominator. 3. Nominate 11 other bloggers with less than 250 followers. 4. Create 11 new questions for the nominees. Q: What is one of your favorite daily rituals? A: Talking to my very best friend before I go to bed at night. A: Any form of chocolate and peanut butter… Yum! Q: You’re gifted $150. How do you treat yourself? A: Spring shopping… duh! Unless of course the boyfriend is in town. Then maybe a boat rental or a fun night out! It’s all about what makes you smile. Q: Name a place you’d love to visit (and tell us why!). A: I have wanted to go to Italy since I was little. My parents toured the country last year and I was entirely envious! The food, the sites, the history – there are a million reasons. Plus, my family originates from Sicily. Q: What’s your favorite spring trend? A: I’m loving all the bright colored heels right now. I’m still searching for the perfect pair. Q: What was your last random act of kindness? Surprise by mail! Sending a random “thinking of you” card to a friend always makes for a sweet and sentimental treat. Q: What’s a favorite quote? A: “You can always tell who the strong women are. They are the ones building one another up, instead of tearing each other down.” This quote inspired my #talkprettytome challenge inspiring those to seek the positives in the creative world rather than the comparisons. Q: If you could relive any year, which would you go back to and why? A: My first year out of college was one for the books… and it would be under chapter “This is Hard”. I would love to relive my first year in the working world knowing what I know now. I would be more confident and definitely worry a lot less! Q: What’s your biggest pet peeve? Q: How do you like your coffee? A: Nonfat latte, 2 Splendas. A girl’s gotta through in a mocha-frap everyone once and awhile though! Q: What quality or characteristic do you most love about yourself? A: I am most proud of my ability to think for myself. Though my stand-up-to-the-big-dogs-attitude may have gotten me in trouble in my younger years, it is a quality that I am glad I have. It is important for a person, especially a young lady, to stand up for herself and what she believes in. No one should tell you what to think except yourself. 20 Something Gal – just launched! 2. Where do you call home and what do you enjoy most about being there? 3. What is one place everyone should visit and why? 4. What professionals inspire you? 5. What is your ultimate goal for your blog? 6. What is one thing you don’t leave the house without? 7. How do you take your coffee? 8. Do you ever experience writer’s block? If so, how do you deal with it? 9. What is the best advice you can give your fellow bloggers about how to get new subscribers? 10. What is something people would be surprised to know about you? 11. 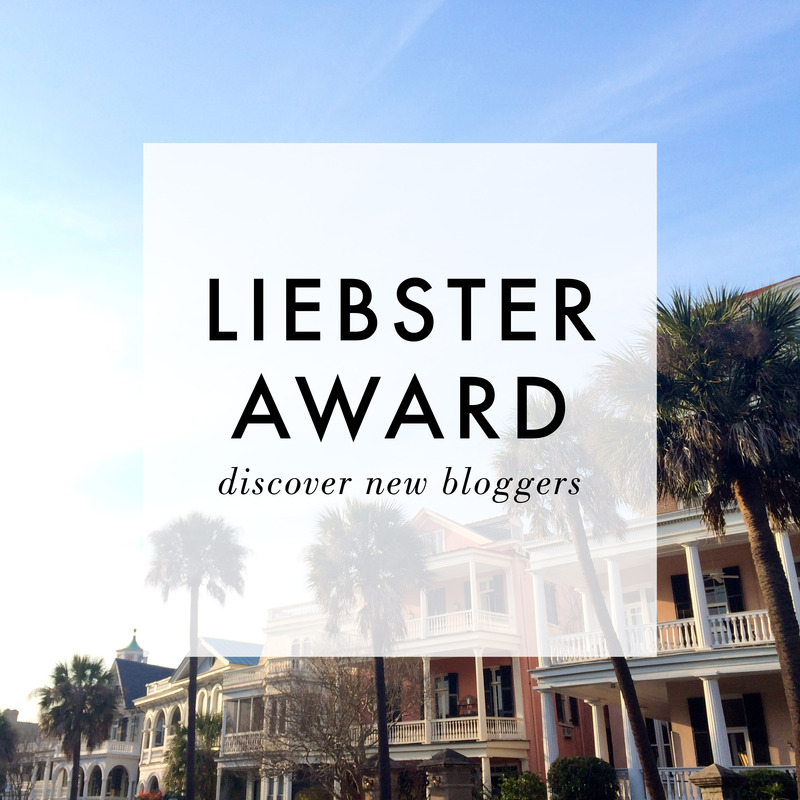 What 11 new bloggers do you nominate for the Liebster Award? Nominees: Once you’ve posted your Liebster Award questions, share the love on social media (@blancblog)! I’d love to read them! You are the sweetest and congrats on your well deserved Liebster! I got mine awhile back but I am still honoured that you thought of me. ( One of the rules is having under 250 followers I think-). Again though, thanks for thinking I’m special!! Thanks so much! I hadn’t realized you had already been awarded – that is wonderful! I love your content and you getting this award was definitely a no-brainer. 🙂 I look forward to seeing more posts! Thank you! And many more thanks for the nomination. It was fun to participate and interact with fellow new bloggers. I loved this! This is such a fun way to get to know other bloggers and brands out there. I love reading through all of these and I am honored to have been nominated. I must say I’m a huge fan of your Brand Tarah! Your #Talkprettytome quote is just so beautiful and is definitely inspiring to a lot of women out there – especially me! I’ll be posting my link soon!